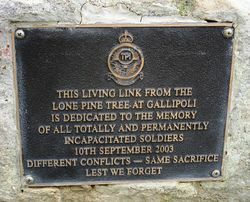 The Lone Pine tree commemorates all totally and permanently incapacitated soldiers. "The Lone Pine Commemorative Tree"
In 1915 Lance Corporal Benjamin Smith of the 3rd Battalion pocketed a pine cone at Gallipoli and later sent it home to his mother at Inverell in New South Wales. 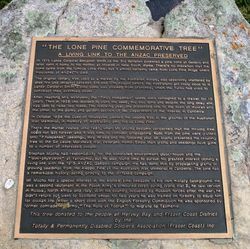 There`s no indication that the cone came from the famous Lone Pine, but it almost certainly came from Lone Pine Ridge where thousands of ANZAC`s died. 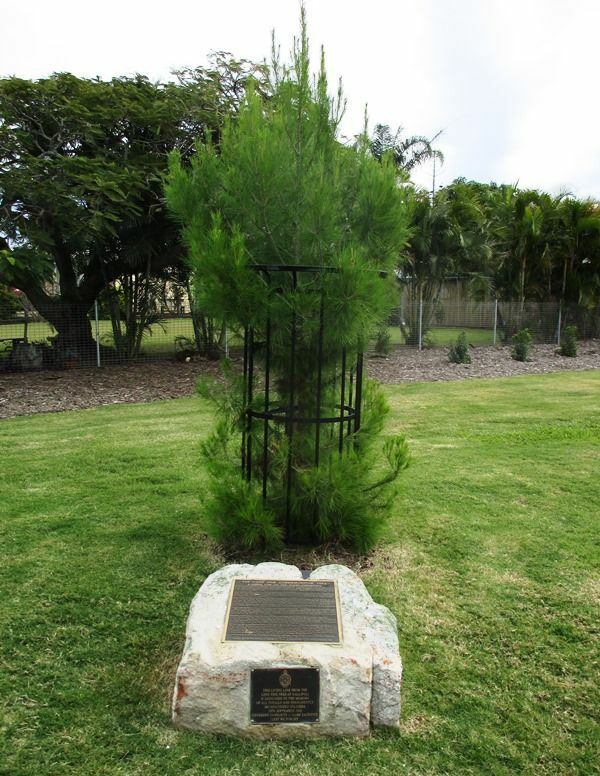 The original solitary tree used as a marker by the Australian troops, was apparently shattered by shell fire and shrapnel between 5th and 10th August before the Australians got really close to it. Lance Corporal Smith`s pine cone was plucked from the branches, which the Turks had used to construct their overhead cover. After reaching Mrs McMullen, the "Pinus halepensis" seeds were consigned to a drawer for 13 years. Then in 1928 she decided to plant the seed, this was done and despite the long delay she was able to raise two trees. The following year she presented one to the town of Inverell and the other to the parks and garden section of the Department of the Interior in Canberra. In October 1934 the Duke of Gloucester planted the second tree in the grounds of the Australian War Memorial, in memory of Australians who fell at Lone Pine. There the matter rested until 1981, when Mr Mucha became concerned that the thriving tree would not last forever and it was time to consider propagating. Buds from the pine were grafted onto "P. halepensis" seedlings, they thrived and the following year Mr. Mucha presented the resulting tree to the Sir Leslie Morshead War Veterans Home. Since then grafts and seedlings have gone to a number of interested people. Stephen Mucha had responsibility for the controlled environment glass-house and the "Mini-phytrotron" at Yarralumla, but he also found time to pursue his greatest interest cloning a living link with the 1915 ANZAC Gallipoli Campaign. He has done this by propagating grafts or growing seedlings from the Aleppo Pine at the Australian War Memorial in Canberra. The pine has a remarkable history dating directly to the ill-fated campaign.